Unless you've been living under a pile of giant, blocky pixels for the last few years, you know that Minecraft has become a phenomenom and catapulted the survival genre into the mainstream. Playing to those same strengths is a game you might want to consider Minecraft's quieter, more straightforward cousin. Like Minecraft, you're dropped into a world with a bit of crafting ability and the very real threat of monsters that are soon going to be after you. Unlike Minecraft, your environment is two dimensional. It's procedurally generated, meaning that no two environments you start in will be the same, though they WILL all boast a retro, pixellated style. With your customised character, flimsy sword, pick axe and wood axe you'll need get to work mining ore and chopping down trees pretty sharpish. The first character you meet will tell you how to craft, and you'd best pay attention because as soon as the sun goes down there are going to be monsters everywhere, and you don't want to get caught in the open. Terraria also has an online multiplayer element that throws other players to work with or against into the mix. 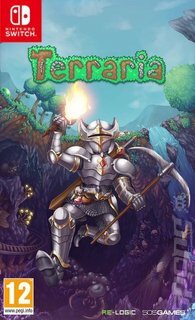 In short, Terraria is a 2D survival games that can justifiably be called 'easy to learn, difficult to master'.